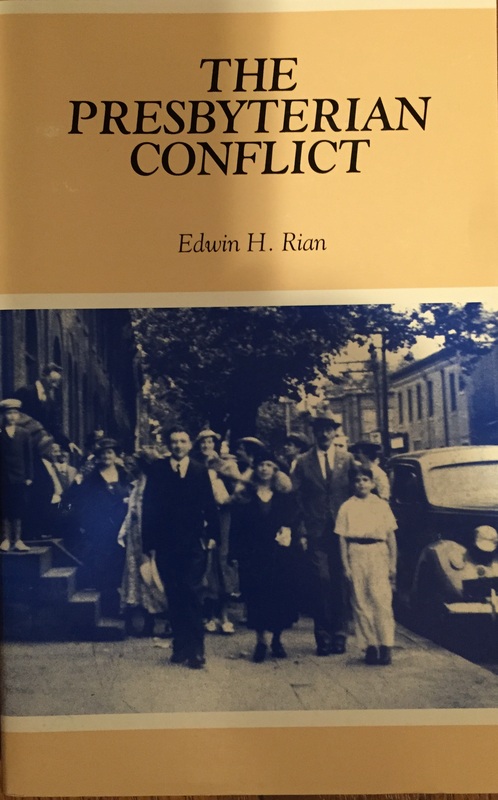 The Presbyterian Conflict, originally published by William B. Eerdmans in 1940, is a monument to a cause that continues beyond Edwin H. Rian’s involvement with it. To many it remains the classic inside look at the valiant effort to preserve Presbyterian orthodoxy and ecclesiastical integrity. The figure of J. Gresham Machen, the man so revered and relied upon by Mr. Rian in those days, stands behind the work. The book itself, therefore, pays tribute to this remarkable servant of Jesus Christ. However, it sets before us more than the reputation of one man. In it we confront issues that demand reflection and repentance from the twentieth-century church if she is to be true to her Savior. The Committee for the Historian of the Orthodox Presbyterian Church reissues The Presbyterian Conflict to the glory of God. We make no further comment but encourage you to allow this outstanding work to speak for itself. The Rev. Dr. Edwin H. Rian, whose ministry was mainly devoted to education, including 15 years as assistant to the president of Princeton Theological Seminary, died on Tuesday at the Pacific Region Health Care Center in San Diego. He was 95 and lived in San Diego. In a career that spanned more than half a century, he was president or vice president of six institutions. Dr. Rian was a leader of the fundamentalists who broke away from the main body at the Princeton seminary and formed the Westminster Theological Seminary in Philadelphia. He later served on the Westminster board, but left in 1946 to join the Christian University Association as general secretary. The next year he re-entered the Presbyterian Church of the U.S.A.
Edwin Harold Rian was born in Minneapolis, graduated from Princeton University in 1927 and was ordained a Presbyterian minister at Princeton Theological Seminary in 1930. He then studied at the University of Berlin and the University of Marburg in Germany as a Princeton Fellow. After his stint at the Christian University Association, he held administrative posts at Trinity University in San Antonio, Beaver College in Jenkintown, Pa., Jamestown College in North Dakota and the Biblical Seminary in New York. He then worked at the American Bible Society and as an education consultant before becoming the secretary of James McCord, president of the Princeton seminary, in 1967….